The latest Russian military technology, which has never been shown to the public before, is planned to be put on show on the May 9 Victory Parade. RIR has chosen five newbies of Russian weaponry which in the foreseeable future will be included in the arsenals of Russia’s ground forces. 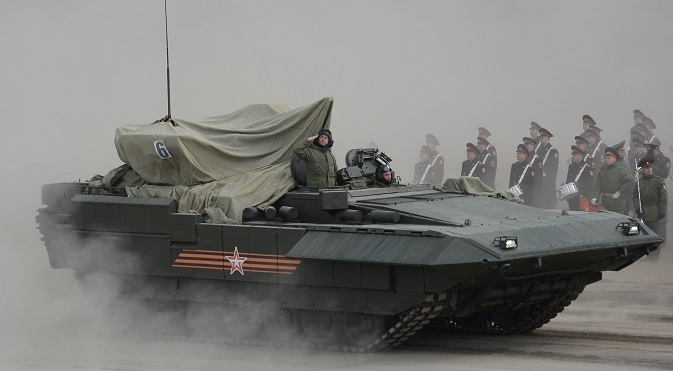 The Т-14 tank was developed using the Armata platform. It will enter the army as the new main battle tank for Russian ground forces. A key feature of the Т-14 is the unmanned turret, all three crew member will sit in a special capsule at the base of the tank. The new vehicle will have a 125 mm 2A82A cannon, equipped with automatic loading, a 30 mm twin-barreled machine-gun, and also 12.7mm automatic cannon. The technical group using the Armata platform is designed according to the modular principle, so that repairs can be made simply by replacing components with new ones. This dramatically simplifies battlefield repairs. Furthermore, all new armored vehicles can be delivered to the battlefield by airplane or train and due to the latest onboard equipment are integrated into a unified information space for automated systems management of troops and weaponry, which means that they are capable of conducting network centric warfare. Self-propelled unit, which will replace the ACS MSTA-S, is also designed using the Armata platform. The Coalition has an unmanned combat compartment where there is an automated pneumatic loading system, which ensures a high rate of fire. The ACS is capable of hitting ground targets at a distance of 70km while in a high rate of fire mode. The new loading technology enables quick preparation for firing and can also change its deployment within a minute. The main armament is located in the turret where the twin artillery guns are located as well as the ammunition and loading mechanism. The engine is placed in the rear of the vehicle. The Kurganets-25 is a universal long-range medium class tracked platform, which is intended to be the basis of a mechanized infantry combat vehicle, landing vehicle, tracked armored personnel carrier and anti-tank self-propelled unit. The Kurganets-25 will be the first Russian infantry combat vehicle in which the infantry will be separated from the module with the weaponry and munitions. The Kurganets-25 is equipped with the Epoch unmanned combat module. It was created for the arming the new Boomerang armored vehicle. This module can be remote controlled from the commander’s terminal and the gunner is not located within the armored vehicle. Armaments include a 30 mm automatic cannon 2А42, paired with a 7.62 mm machine fun and an anti-tank missile system Kornet-EM (four missiles from two launchers at the sides of the turret). The Bumerang is a medium class wheeled unified platform, which will be the basis for a whole range of combat and auxiliary vehicles. The Bumerang wheeled platform should become a single main platform for the creation of combat vehicles (mechanized infantry vehicles, armored vehicles, wheeled tanks, and also the chasse for special purpose equipment). The Bumerang is an 8x8 wheeled vehicle with a remotely controlled weapons module and ceramic armor. When equipped as a light or medium vehicle it can cross water obstacles. A Mine-Resistant Ambush Protected vehicle the Typhoon class comes as a 6×6 and 4×4 wheeled vehicle for transporting infantry. The vehicle is guaranteed to withstand an explosion beneath its wheels or body with a charge the equivalent of 8 kg of explosives. The combined steel and ceramic armor can withstand armor penetrating B-32 bullets. The vehicle weighs 25 tons and is equipped with a 450 horsepower engine, automatic transmission and can transport 16 marines. Furthermore, the vehicle has the CICS GALS-D1M monitoring system for observing and regulating the engine’s operation, calculating the vehicle’s roll, slope of the road, speed and to determine its location.